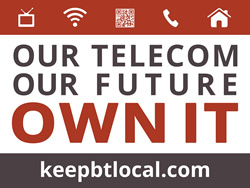 Maine Fiber is proud to partner with Keep BT Local in the purchase of Burlington Telecom. We see a Burlington Telecom cooperative as a great investment, now and in the future, because there is enormous potential to expand beyond Burlington and provide the region with a much-needed resource that will connect homes and businesses to the world at speeds otherwise unavailable. Our company would be open to targeted investments to help speed expansion to key markets down the road, but we see our financial investment right now as a loan to help this community keep control of this important asset, and to help grow it’s already thriving and innovative tech economy. I want to be clear that Maine Fiber has no interest or intent in owning and operating Burlington Telecom—not today, tomorrow, or in 10 years. We work with our customers and community partners to realize their own vision of reaching that last mile to bring fiber to rural and other areas underserved by national competitors. We are confident that the Keep BT Local business plan is solid, and our financing will help it get to where it wants to be — which is a fully independent business that is owned and run by its members. We couldn’t be more excited by this innovative model that is part of a national movement as communities turn away from multinational providers. Throughout this process, I have been impressed by the tenacity, enthusiasm, professionalism and knowledge of the current KBTL board, and have no reservations that they will hire in a top tier management team – as needed – and will ensure that the best managers will be running this utility. I’ve been equally impressed by the community and business leaders who have stepped up to say they will help ensure this enterprise succeeds. I look forward to working with KBTL for years to come, and helping to expand this powerful network to reach more homes and businesses throughout the region – but especially right here in Burlington. With the time line being as limited as it was to review the final terms with all of the background data required, it became evident that further negotiations would be necessary to finalize the new agreement. Those negotiations are continuing and will be finalized as soon as possible.